The rankings of the MBA colleges for the year 2017 has ben released and the IIM Ahmedabad is again on the top of the list followed by other IIM institute. In the list of top management colleges of India, there are 9 colleges of Indian Institute of Management. The list of the colleges has been released by the Union Minister of Human Resource Development, Mr Prakash Javadekar on 3 April 2017. The parameters used for the Ranking 2017 are almost similar to those used last year. However, at the level of the details, some of the sub parameters have been modified for a more efficient system of the rankings such as this year, the percentile metric has been replaced by the more discriminating metric. As per the experts saying, the list of the ranking of the institutes has been prepared to extensive inspection for consistency and correctness by a team of experts. IIM Ahmedabad holds Rank 1 in NIRF Ranking - Key Highlights! One of the most interesting features of this year’s Rankings is the ranking of General Degree Colleges in Arts and Sciences from across the country. 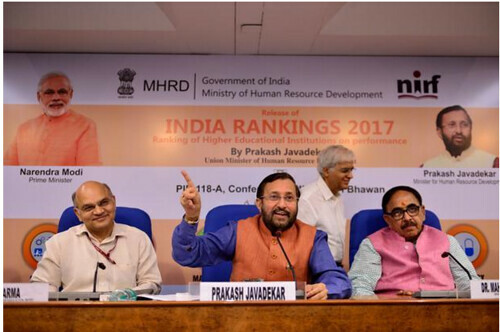 The Minister said so far no one has raised fingers on the ranking charted out by the National Institutional Ranking Framework (NIRF) working under his Ministry. He said besides institutions now parents and students will also have worth information’s about the ranking and quality of a particular university, college or vocational institution. This has led to the global scaling up of our credentials. The list of the top 10 management colleges of India which is released by the Union Minister of Human Resource, Mr Prakash Javadekar on 3 April 2017 is given in the table below. The readers are suggested to have a look at the table given below. The Miranda House of Delhi holds the number one position in the list of the colleges.